Me: how many tortillas did you eat? Me: each one has half your daily fiber requirement. 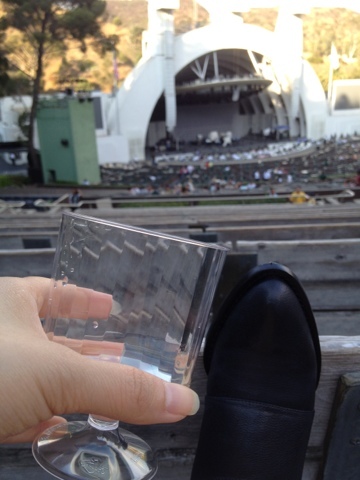 At the Hollywood bowl now. Vv is in the bathroom. Here early so it's still pretty empty. So many bugs. Drinking heavily marked up Cupcake Sauvignon blanc. Waiting for hot chip and passion pit. Nice out now. Except for the bugs. Should wear long pants next time maybe. Learning the hard way that "three fingers of whiskey" varies wildly from person to person. I suppose I should be pouring a "hand" of whiskey instead. Photo taken with the birthday boy's makeshift photobooth setup.